Sampling New York street food is a great way to eat like a local New Yorker! The service is quick and the food is hot, good quality and, most importantly delicious. There is also lots of variety: try Mexican tacos, Korean barbecue chicken or Belgian waffles. Is your mouth watering yet? New York street food is really good, honestly! Over the years, I’ve seen food carts become more professional and the quality increase tremendously. Now they really bring in the crowds, especially in Midtown and Financial District. You’ll see a lot of food carts primarily catering for the office workers, grabbing a quick bite on their lunch breaks. In these areas, there are a wide variety of delicious foods on offer. So, whether you’re heading to a Broadway show and want a quick bite, or you just want to explore the different cuisines available, (New York is the melting pot after all!) I highly recommend trying some New York Street Food. 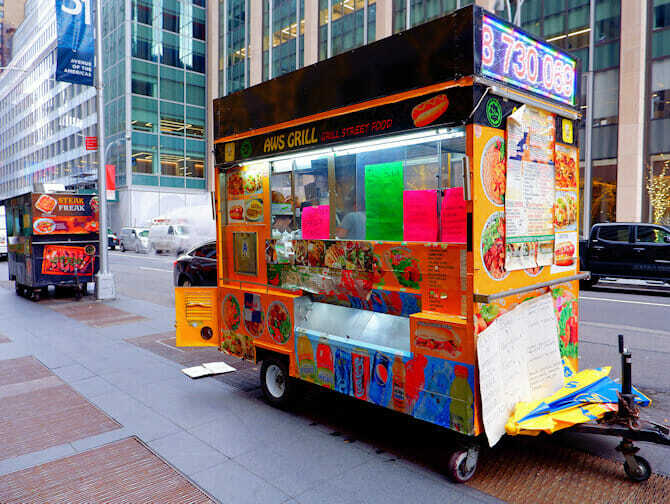 If you don’t feel like exploring the food carts on your own, or you just want to learn more about their history and variety, take the New York Food Cart Tour. 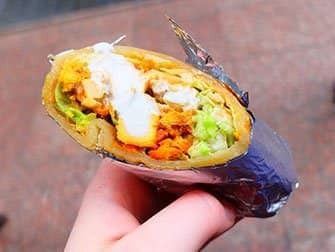 On this tour, you’ll explore and sample a variety of street food that has become so popular it attracts so many New Yorkers, for lunch or dinner. Together with a local guide, you’ll explore the carts in either Midtown or the Financial District. Have a light breakfast as you’ll want to be hungry! The tour includes six generous samples. 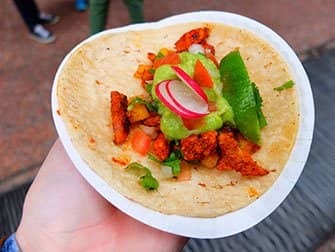 You’ll start either in Midtown or Financial District, where your guide will begin by explaining a little about the concept of street food and food carts and trucks in general. Specifically, how did they become so popular? Is it safe to eat street food? Is it hygienic? Really? After the introduction, the most important part of the tour begins: the eating! Over two hours, you’ll walk to six food carts. At each, receiving a variety of tasty treats. You’ll also get the opportunity to talk to the vendors in person. 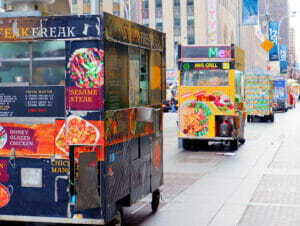 They’ll tell you all about the city’s restrictions, rules and gossip on the food cart rivalries. 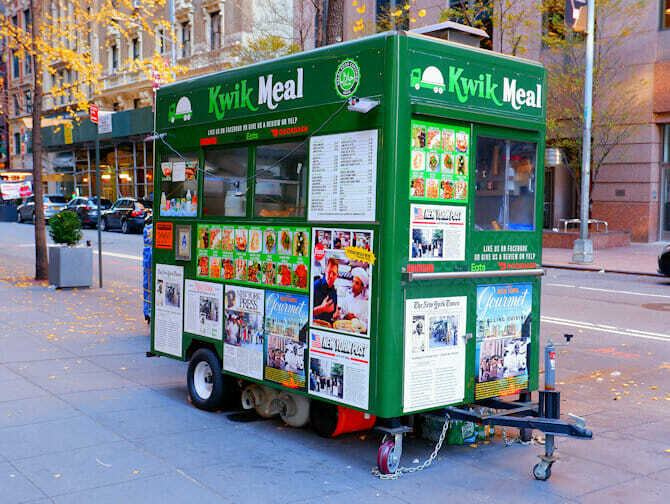 Erics Tip: I’m a big fan of New York food carts, they serve real quality food within minutes. They can adapt your order, any which way without even blinking. I have my own favourite, a cart that sells the best gyros and because of that, I’ve never really taken the opportunity to explore other options: there’s just too many to choose from! This tour was a great way, even for me, to try different carts. I also spoke with a few of the vendors, it was great to learn about their businesses and incredible work ethic. I thought the samples were very generous: I didn’t even need to eat dinner that night!